This interesting and unusual surname is of Manx origin, and is a contraction of the Gaelic "MacThorketill, MacThorkill". The Gaelic name is composed of "Mac", son of, and the Old Norse personal name "Thorketill" and "Thorkell". The given name is recorded in the Domesday Book of 1086 as "Turketel" (Norfolk and Suffolk), and "Turkil" (Suffolk), and derives from the Old Norse "Thor", the name of the God of Thunder in Scandinavian mythology, and "ketill", (sacrificial) cauldron. The name "Thurkill" and "Thirkill" was in use throughout England in the Middle Ages; in northern England it had been introduced directly by Scandinavian settlers, whereas in the south it was the result of Norman influence. Corkill is first recorded in the Isle of Man in 1505. 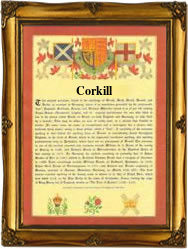 In the modern idiom the surname can be found as Corkhill and Corkill. Recordings of the surname from the Isle of Man Church Registers include: the christening of John, son of Thomas Corkill, which took place at Braddan on June 20th 1647; the christening of Ewan, son of Dond Corkill, which took place on December 26th 1648, at Maughold; and the marriage of Donald Corkill and Issabell Colteam, which took place at Maughold, on June 12th 1652. The first recorded spelling of the family name is shown to be that of Donald MacCorkyll, which was dated 1408, in "Manx Names", by A.W. Moore, during the reign of King Henry 1V, known as "Henry of Bolingbroke", 1399 - 1413. Surnames became necessary when governments introduced personal taxation. In England this was known as Poll Tax. Throughout the centuries, surnames in every country have continued to "develop" often leading to astonishing variants of the original spelling.